IKEA’s new Las Vegas store is now home to the Nevada’s largest solar array on a retail location. The system will become operational when the retailer opens for business May 18. The megaproject took 3,620 panels across its more than 240,000-square-foot canvas. The 1.14 MW system will produce approximately 1,750,000 KWh for the store, reducing the operation’s carbon footprint by 1,207 tons of carbon dioxide. This equates to powering 166 homes and eliminating the emissions of 254 cars every year. The project completes IKEA’s 43rd instillation at one of its U.S. locations. The home furnishing retailer has solar installed at nearly 90 percent of its U.S. presence. The company has 41 retail stores across the country. IKEA’s generation goal is 40 MW in its domestic presence. On a global level, IKEA has installed more than 700,000 solar panels across its holdings and has allocated $2 billion for future projects through 2020. The retailer also owns 157 wind turbines across Canada and Europe and an additional 104 in the U.S. 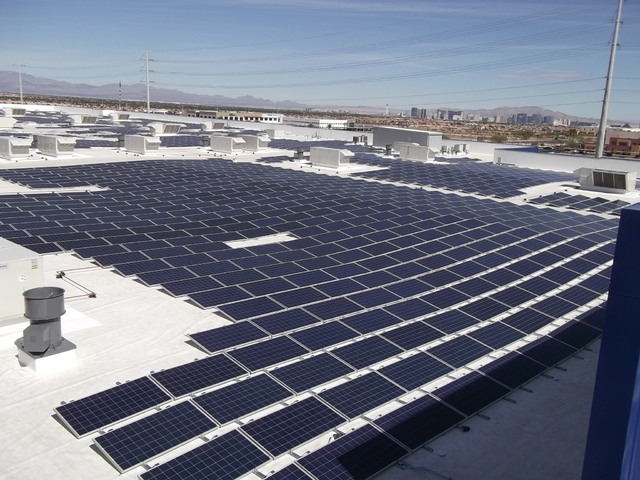 The solar array project in Las Vegas was developed, designed and installed by Helix Electric. That firm’s footprint of projects stretches across Idaho, Texas, Arizona and Hawaii. Victor Fuchs, president of Helix Electric, said the IKEA Las Vegas store is one of the biggest projects in town. IKEA is the sole owner of each of its photovoltaic rooftop systems. It chose not to lease or do a power purchase agreement. The company also has taken several strides toward sustainablity efforts in the U.S.— recycling waste material, using energy-efficient HVAC and lighting systems and using recycled construction materials. The retailer also installs skylights in the warehouse area, uses water-conserving restrooms, eliminated the use of plastic bags from the check-out area and facilitates the recycling of customers’ compact fluorescent light bulbs. IKEA also plans to increase its reach into the green space with plans to install electric car charging stations. So far, the brand has them in place at 13 locations. The 351,000-square-foot IKEA building is being built by R&O Construction. The contractor is also managing the 26-acre site at the 215 Beltway and Durango Drive.